After this review of my book recently appeared in the Montreal Gazette, I understand that a lot of people from the Point are upset with me. And quite frankly, I don’t blame them. If I believed every word in that review, I’d probably be deeply offended as well. I mean, how could they know that the book is written in the voice of an eight-year-old child, with that child’s limited point of view, ending when that child is still only a teenager in high school? Since they haven’t, you know, actually read the book? Okay, maybe I would have actually read the book first before threatening to pull my support from Saint Columba House, a non-profit organization in the Point which has been dedicated to making an enormous difference in the lives of countless families for decades now, if they continue to allow my book launch to happen there as planned for November 4th. But I also understand that feelings can run deep when it comes to many of us who grew up (and still live) in Point St. Charles. Yet as I recently said during an interview with a writer from Maisonneuve magazine, if I had to grow up poor anywhere, the Point was the best place. I mean, where else could you have watched a hockey game while walking home, as I often did as a kid, on all of those small TVs perched on chairs on the sidewalks? I think we all know that terrible things can happen to people no matter where they live. And as I believe I made clear in my book, the ‘enemy’ isn’t Point St. Charles. Of course it isn’t. The enemy is poverty, and what happens when people are powerless, lack hope, and have no voice. Of course, not everyone growing up in Point St Charles in the 60s and early 70s felt powerless, lacked hope, or were filled with shame over the secrets they were forced to keep as a child. And if my adult self could go back in time, I would tell my eight-year-old self that yes, some people in the Point actually were eating oranges. But that’s the funny thing with children, they believe that what they live is a mirror of the rest of the world. As adults, we know that about kids. I figure everyone who reads my book will also figure that out, too. I expect, and have always expected, that not everyone will like, agree with, or approve of my book. I’ve never claimed, nor am I promising now, that no one will be offended by what I have to say. But what I have also always been clear about, including in the book, is that this is only one person’s story, and a very personal one at that. I would never presume to speak for anyone else. 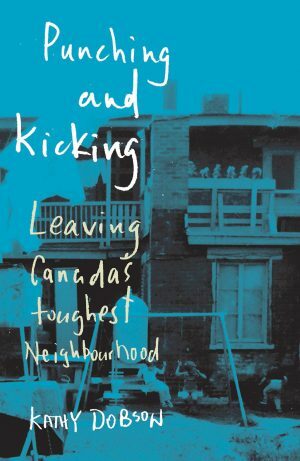 If everything goes according to plan, in less than 30 days, I should be finally holding an official published copy of my book, With a closed fist: Growing up in Canada’s toughest Neighbourhood. Now I’m starting to think about the fact that other people, including complete strangers, will soon be reading my words about growing up in the Point. It feels scary and exciting and unbelievable, all at the same time. What will people think of it? How will my readers react? I can’t help but cringe a bit at the thought of certain people, like the newspaper and magazine editors I work for, reading about some of my most embarrassing, even humiliating, moments from when I was a kid.